Line a 9X2 inches round cake pan with parchment paper. Preheat oven to 350F. In a food processor, pulse Oreo crumbs, hazelnut, sugar, and salt until finely grounded. Mix in melted butter until ingredients are moist. Pack into the bottom of prepared cake pan and bake for 20 minutes. Cool to room temperature. Lower oven temperature to 250F. In a standmixer, beat cream cheese until homogenous. Mix in sugar and scrape mixing bowl from time to time with spatula. Add in eggs one by one, ensuring each is fully incorporated. Mix in vanilla and hazelnut liquor. Take 2 cups of the cream cheese mixture and mix with melted chocolate by hand. Mix chocolate mixture with cream cheese mixture until thoroughly combined. Pour filling into cake pan and smooth the batter with an offset spatula. Bake for 3 hours and turn off the oven. Let cheesecake cool in the oven until it reaches room temperature. Store cheesecake in freezer for at least 4 hours until frozen. To unmold cheesecake, gently heat the bottom of the frozen cheesecake to loosen the cake from the pan. Invert cake and unmold onto cake board. Peel away parchment paper. With an offset spatula, spread a very thin layer of Nutella on top of the cheesecake. Ensure any cracks are filled in. Let cheesecake stand at room temperature while you make the glaze. To make the glaze, melt the chocolate in a bain-marie. Boil the cream and pour cream onto chocolate with the corn syrup. Stir the mixture very slowly until homogeous, ensuring the least amount of air is incorporated to avoid air bubbles in the ganache. Add hazelnut liquor and combine. Let the glaze cool to 37C (body temperature). To glaze the cake, set the cheesecake on a grid on top of a 11X17 pan. With a steady hand, pour the glaze onto the centre of the cake and just let the glaze cover the entire cake. Avoid the temptation to smooth the glaze with any tools. Bang the grid against the pan a few times to knock off excess glaze. Remove the glazed cake from the grid with a large offset spatula. 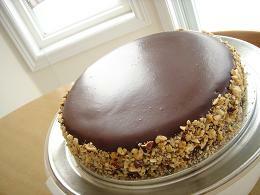 Decorate the side of the cake with chopped hazelnuts. Store the cake in the refrigerator. If you prefer neater slices, freeze the cheesecake for an hour before cutting because half-frozen cheesecake is easiest to cut. Cake can be stored in the refrigerator for up to 2 days.